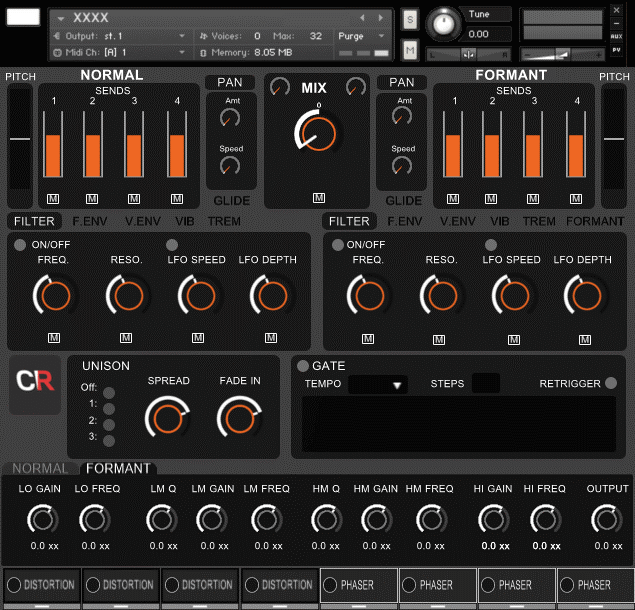 Channel Robot is an English company that develops virtual instruments and sample libraries for DJs, producers, and musicians. Their most recent release is FreeForm – a free rompler for Kontakt 5. He uses the company’s Formula engine to shape the sound and some of the audio material came from Project Pegasus – a free sample library from 99Sounds. It is a collection of 40 instruments such as piano, synth, bass, pads, guitar, brass and more, in the nki format. Each instrument is made of a Normal and a Formant sound, with independent controls for volume, tuning, pan, glide, effects, filter, LFO, vibrato, tremolo, and more. The upper right will shape the Normal sound, and it has controls for pitch, pan, and glide. There are also four independent effects slots, that will control the amount of FX sent to the voice. There are several built-in effects, such as reverb, delay, phaser, flanger, chorus, rotator, tape saturator, cabinet, distortion, and much more. The upper left has similar controls for the Formant sound. In the middle, there’s a mix knob and individual volume controls. Below it, there is a set of individual Normal and Formant controls for Filter, Filter Envelope, Velocity Envelope, Vibrato and Tremolo. FreeForm also has a Unison feature, with Spread and Fade In controls, where it’s possible to set from 1 to 10 voices per note. A nice feature is the Gate, that works like a step sequencer to create rhythmic sounds. The effects section have a dedicated interface where it’s possible to customize the parameters of the selected effect. Another cool feature of FreeForm is the modulation system. It is available for each one of the four effect slots on each voice, and also for filter, envelopes, vibrato and tremolo sectors.